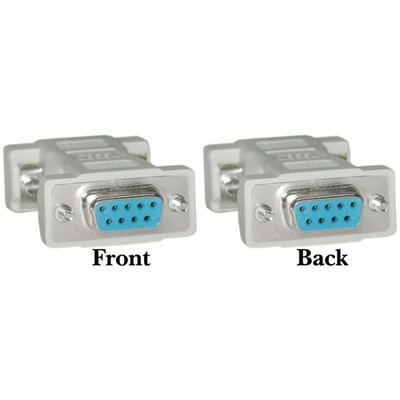 More Product InfoThis is a female to female null modem adapter for use with null modem cables. A null modem cable is a RS-232 serial cable where the transmit and receive lines are crosslinked; this adapter works with all null modem cables. Works perfectly except for connector screws, which won't back out of the connector unless forced with a tool - screwing them out doesn't work. Ideally, these screws should "float" in the adapter, without falling out -- a "captured" screw. These don't float, and if you back them out with a tool (in my case, I forced them out with the tip of a #2 Phillips), they'll then respond to being screwed in or out with a small (straight-blade) screwdriver. If you can get past this (e.g., you'll be hooking them up once or rarely disconnect them), they work perfectly. And for the price, it's hard to pass up.